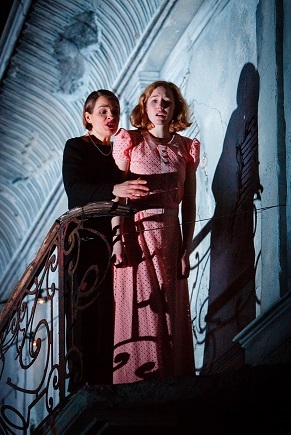 Cornish theatre company Kneehigh have built a reputation for exciting and unexpected stage adaptations and this new production of Daphne du Maurier's dark classic Rebecca is no exception. With a nod to Gothic horror and Alfred Hitchcock's dramatic symbolism, the tale moves relentlessly on as we learn the secrets of Maxim de Winter and his first wife Rebecca. Imogen Sage is the innocent second Mrs de Winter whose marriage to Maxim and arrival at his ancestral home Manderley causes consternation among the local residents. Sage also manages a highly believable character switch when Mrs de Winter discovers the truth of the mystery of Manderley and comes out fighting. Here is the woman of steel underneath that faltering new bride. 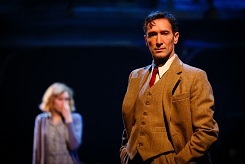 Kneehigh stalwart Tristan Sturrock is initially slightly over-wrought as Maxim. His fretful pacing around the grounds and immediate disjoint from his bride make their whirlwind romance in Europe seem just a little unreal. But as the net tightens he moves more easily into this role. The duo are given stalwart support by Emily Raymond as the menacing Mrs Danvers whose loyalty to the memory of Rebecca would be enough to unhinge the best of us. Directed by Emma Rice and designed by Leslie Travers, the production is packed full of imagination. The opening scene, in which an anonymous body is lowered from the sky and buried under a sailboat, brings an ominous sense of foreboding before even the first characters have spoken. We know that what has been hidden has to be revealed. The scene shifts easily from rambling mansion to seashore and into the intimate space of Rebecca's secret cottage despite few design changes. And something as simple as holding a window frame allows characters to be on the inside looking out or the outside looking in. Where Kneehigh bring their own brand of theatre to the production is in the humour created by song, dance and just a little bit of silliness. Much of this centres on actress Katy Owen who doubles up as the Welsh-accented servant boy Robert and the lost beach child Ben. The Robert character is hilarious as he races around the house grabbing telephones, giving out totally inappropriate pieces of information and generally running amok. It's a far cry from the sombre menace of du Maurier's novel but adds a welcome accent of levity. There's a touch of over-crowding at the finale when not only are we hit with plot revelation after plot revelation but that action is paused with snatches of song and music which, rather than building tension, are somewhat distracting. Bearing in mind the complexities of the story at this point, a bit of simplicity would help retain the pace. There is plenty to capture your imagination in this production. Rebecca has been filmed and staged many times since hitting the best-seller lists but this is certainly an adaptation worth watching out for. At Birmingham Rep until May 2 then at Malvern Theatres May 4-9, Newcastle Theatre Royal May 11-16 and Hall for Cornwall May 10-19. See www.kneehigh.co.uk for full tour details.